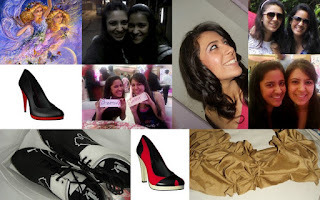 2011 has been very lucky for me as I made my blog this year and improved my fashion skills. I also got to know extra information on blogging. My lucky number is 9 and I chose my blog's best 9 posts. D.I.Y Make Your Own Scarf! This post was liked by many people and I'm a personal fan of it. This post is on my list because it has the shoes and bags which are designed by me. This post reflects me. It talks about my sun sign Gemini. The shoes in this post are my favourite. As I am a basktballer, the shoes mean the world to me. This post has the best advice on what should be worn in winters. Also, I adore winters. Some really good tips on what suits our body and what kind of clothes should we wear according to our shape. The name matches with the work! All of the songs which are in this post cool me down and help me concentrate on my blog. This post is the most special of all because I wrote it on my sister. 2011 was amazing for me! These were my this year's best 9 posts. Now I am ready for 2012. Bring it on. Impressive blog you have here. Came across yours thru IFB. Do drop by mine sometime..